Nancy Sayles, 51, sells a bag of M&Ms to a commuter at the Belleville MetroLink station. She's one of six Challenge Unlimited clients working at the convenience store. A snack shop at the Belleville MetroLink station now employs people with disabilities, providing on-the-job training to a community that often faces barriers to employment. It’s a new opportunity from Challenge Unlimited, a non-profit that connects adults who have disabilities to jobs, job training and apprenticeships. St. Clair County Transit District provides the space and some funding to support the shop, A Quick Bite. In 2018, people with disabilities were unemployed and seeking jobs at twice the rate of persons with no disability, according to the Bureau of Labor Statistics. 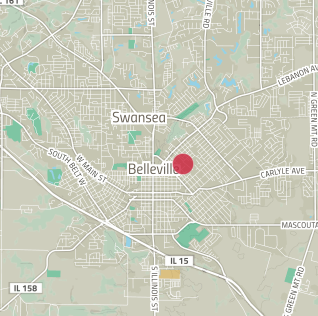 The snack shop is located at the Belleville MetroLink station in St. Clair County, Illinois. Whitney Harvey, a business development associate for Challenge Unlimited, said that the snack shop will help people with disabilities who want jobs get work experience and pursue independence. Nancy Sayles, 51, is training in food service at A Quick Bite after 30 years working as a dishwasher at Scott Air Force Base through Challenge Unlimited. Sayles worked as a dishwasher for 30 years. A Quick Bite will train her in the food service industry. Sayles said she likes the new post at A Quick Bite because she gets to interact with a variety of people. Sayles is one of six employees currently working at A Quick Bite. The employees make a starting hourly wage of $8.25 and work six to 18 hours a week. Employees who handle food at A Quick Bite also get certified as a food handler, which qualifies them to work at other food service locations. Some Challenge Unlimited clients go on to work at other businesses in the community after receiving food service training, Harvey said. People with disabilities face many barriers to employment, even when they are qualified. In a 2012 survey conducted by the Bureau of Labor Statistics, people with disabilities reported a lack of transportation, lack of education or training and a need for accommodations as barriers. 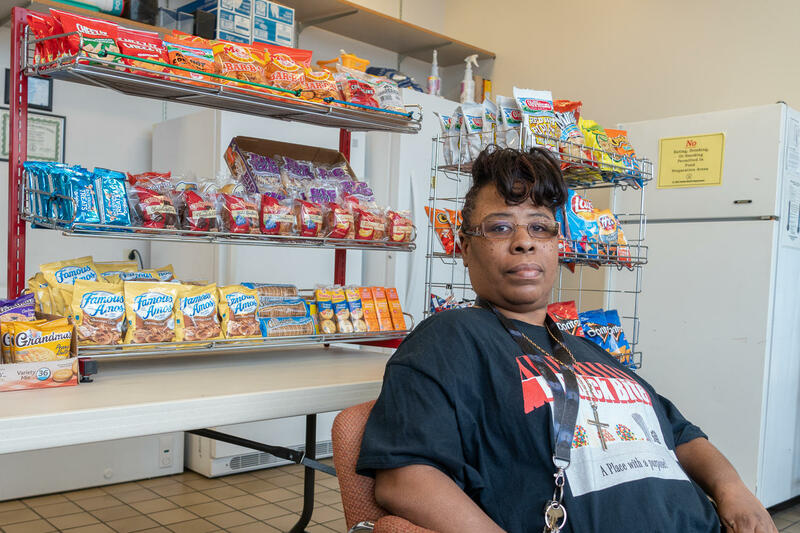 The transit district helps Challenge Unlimited address one of those barriers by providing its call-a-ride service to A Quick Bite’s employees. St. Clair County Transit provides A Quick Bite a rent-free space at the St. Clair Transit Plaza. It also helps fund the shop by providing $2,000 per month, transit district representatives said. Managing director of St. Clair County Transit District Ken Sharkey said that this partnership could also lead to additional opportunities for Challenge Unlimited’s clients. The district will soon replace a retiring part-time janitor and has discussed hiring people through Challenge Unlimited, Sharkey said. The shop is open from 6 a.m. until 6 p.m. Monday through Friday and sells snacks and metro passes to commuters. Despite increased use of public transportation among young adults, overall ridership numbers in the St. Louis region have been on the decline the past four years. And that trend is part of the motivation behind Metro Transit’s newly unveiled hopes for its MetroBus service. “That’s one of the reasons we need to take a fresh look at our system and make some changes to ensure that we’re providing service that meets the needs of our customers and provides a quality, fast ride,” said Jessica Mefford-Miller, assistant executive director for transit planning and system development. This article first appeared in the St. Louis Beacon, Dec. 20, 2010 - With the nation's economy stuck in low gear, a St. Louis organization that provides support for unemployed business professionals is retooling for the long drive home. The GO! Network, which was organized by the St. Patrick Center nearly two years ago, has incorporated as a nonprofit corporation, said Chuck Aranda, who recently stepped down as the program's director. This article first appeared in the St. Louis Beacon, June 8, 2011 - Mark Johnson's always been an advocate of civil rights, even if it means confrontation. When Johnson was 20, he injured his neck in a diving accident and became paralyzed. "I use a wheelchair; I have limited functioning of the arms and hands. I basically have paralysis, and it affects the ability to do things. I even have people to assist with daily acts." All artists use their unique abilities and experiences in their work. Chris Worth is no different. But Worth’s art is informed by a more complicated set of realities than most. Born in Connecticut along with a twin brother, Worth was diagnosed at birth with cerebral palsy. When he was 1, his mother had a stroke. At first, a family friend cared for him. After that, he bounced through several foster families and an educational system that put him on a path toward unskilled labor. At 11, he was adopted by a West Virginia couple who saw his potential as a student and artist. But even in a stable home, he was confused by his attractions toward women and men, an orientation for which he now uses the word “queer.” "Disabled" is the one-word description he prefers in talking about his cerebral palsy. They're part of a long list of identities folded his art.